ZOOZ is a brand of smart home devices that all use the Z-Wave protocol to communicate with your home automation hub, in my case Samsung SmartThings. We have covered a handful of their items in recent reviews at Bigbruin.com, including their ZSE01 indoor siren and their ZSE18 motion sensor. This time around I am checking out their Zen26 Z-Wave Plus S2 smart switch which is promoted as offering a simple solution to making 3-way and 4-way circuits smart. I purchased this switch directly from The Smartest House , who also sells through Amazon.com, and you can expect to pay about $30-$35 shipped for this device. I typically don't mention the price of an item until later in the review, but this is definitely a key selling point of this series of switches from ZOOZ. In a 3-Way circuit you will have two switches, and in a 4-way circuit you will have three or more. With the Zen26, you do not need to replace anything other than the primary switch in your 3-way or 4-way circuit, and the rest of your "dumb" switches can remain in the walls unchanged. While I do have some GE/Jasco switches in 3-way circuits at my house, this setup adds up to a much longer install time, and a much higher price tag. With the GE/Jasco solution you replace the primary switch in the circuit with a Z-Wave switch (also around $30-$35), but then every other switch in the circuit needs to be replaced with one of their auxiliary switches (which cost about $20 each). 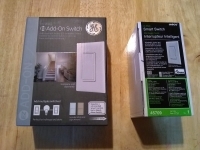 The photo below shows the two devices you would need to upgrade a 3-way switch to Z-Wave using GE/Jasco devices, resulting in twice as many switches to replace and a price tag around $50-$55, instead of $30-$35. In my particular case, I wanted to upgrade a 4-way circuit to Z-Wave functionality that happened to have four switches controlling a few ceiling lights. My installation would have cost about $95 to use GE/Jasco switches versus $35 going with ZOOZ. On top of the cost savings, replacing one switch is obviously much quicker than replacing four.